In honor of last weekend's National Punctuation Day, we've been running a short series of posts on punctuation. JoAnn kicked off the topic by sharing some great links, one to a site I've never seen: Khan Academy. If you didn't follow that link and you have difficulty identifying run-on sentences, I encourage you to head over there as soon as you finish reading this post. Next, Carla shared a terrific example from her own work of how wise punctuation choices can help engage the reader. Before I wrap-up this series, I want to thank everyone who entered our giveaway of Cheryl Klein's The Magic Words, and to congratulate our winner, Cathy M! The biggest punctuation challenge for my beginning students--both adults and children--seems to be dialogue. When I was a novice writer trying to understand how to punctuate dialogue, I studied examples in published works. Since I started out as a freelance newspaper writer (aka "stringer"), those early examples were quotes in newspaper and magazine articles. Later, when I turned to fiction, I modeled the punctuation I used on that in the novels on my shelves. Fortunately, they were all American publications, so the use of punctuation was consistent. I later discovered that British publications follow different rules, rules that are almost the direct opposite of ours. No wonder so many of my students were confused! For a brief overview of the differences, see this page of The Punctuation Guide. 1. All dialogue should be set off with beginning and ending double quotation marks. 2. Make sure you start a new paragraph whenever a speaker changes. “Oh, Sal,” my father said. “Come on. There’s Margaret.” He waved to the lady at the door. As time went on, I kept adding more rules and examples. Then I found this page at The Editor's Blog. I've listed the site as a reference at the end of my handout so I don't have to update it anymore. 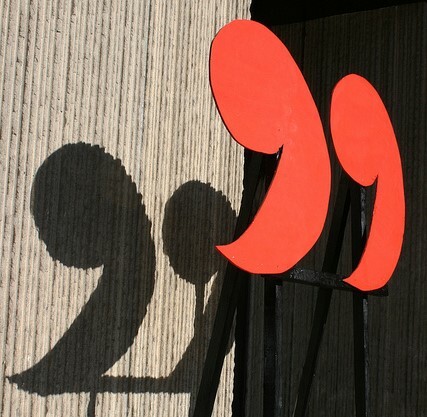 If you're looking for lesson plans on teaching punctuation, check out "And I Quote: A Punctuation Proofreading Minilesson" and "The Passion of Punctuation", both at Read. Write. Think. Both also contain links to additional punctuation resources. 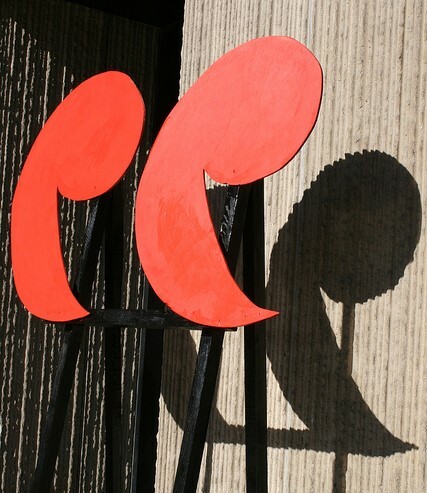 To wrap us this celebration of National Punctuation Day, I suggest you read these Top Ten Tips at The Punctuation Guide. Also, before you head over to check out this week's Poetry Friday roundup at Karen Edmisten's blog, you might enjoy reading these children's poems about punctuation. Reminder: There are only a few days left to enter the Goodreads giveaway of my middle-grade novel, Rosa, Sola. Thank you for these resources...and I love your Write With Joy!